What Day Of The Week Was January 3, 1944? 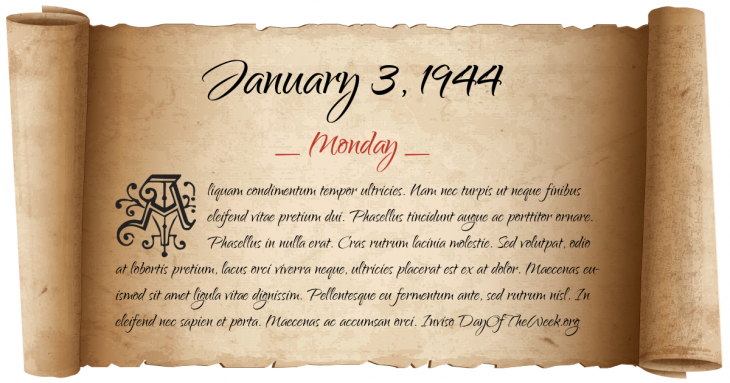 January 3, 1944 was the 3rd day of the year 1944 in the Gregorian calendar. There were 363 days remaining until the end of the year. The day of the week was Monday. A person born on this day will be 75 years old today. If that same person saved a Cent every day starting at age 3, then by now that person has accumulated $264.05 today. World War II: Top Ace Major Greg “Pappy” Boyington is shot down in his Corsair by Captain Masajiro Kawato flying a Zero. Who were born on January 3, 1944?